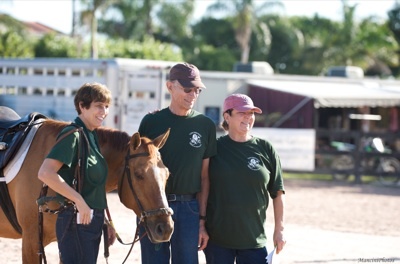 Wellington, FL – February 22, 2013 – Equestrian Sport Productions is pleased to announce that they will host the annual Special Olympics Palm Beach County Equestrian Games on Saturday, February 23, in coordination with Vinceremos Therapeutic Riding Center (VTRC). Competition will be held in the Equine Tack & Nutritionals Ring 6 of the Palm Beach International Equestrian Center (PBIEC) during week seven of the FTI Consulting Winter Equestrian Festival (FTI WEF). The competition will begin at 9:00 a.m.
Sixty riders ranging in age from eight to 40 years old will compete for the chance to advance to the Special Olympic Area Equestrian Games, which will be held March 23, 2013, at the Van Kampen Arena on the Adequan Global Dressage Festival grounds at The Stadium. Riders hailing from Broward, Palm Beach, Okeechobee, St. Lucie and Martin counties will all by vying for positions to qualify for the State Games in Tampa this April. A rider at last year’s Special Olympics Palm Beach County Games celebrates. Photo © ManciniPhotos. 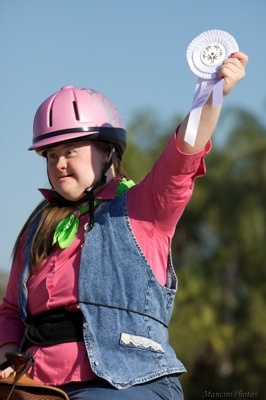 The Special Olympics Palm Beach County Equestrian Games tomorrow will showcase riders as they overcome their disabilities and concentrate on their riding capabilities. Following the completion of the class, riders will participate in a parade at midday in the International Arena of the PBIEC. Exhibitors and spectators are encouraged to come support the riders throughout the competition at Ring 6 as well as during the parade in the International Arena. In addition to local riders, five special needs riders from the Chateaublond Equestrian Center in Haiti will also be competing on Saturday. These riders, including 2009 FEI “Against All Odds” Award recipient Darlene Milord, travel to the United States annually to compete in the class as a part of the Friends of the Orphans Organization. The program at Chateaublond enables disadvantaged special needs orphans the extraordinary opportunity to travel to the United States to compete in the Special Olympics classes. For these riders, the experience is especially memorable since many of their trips have been years in the making while paperwork is completed for their passports. 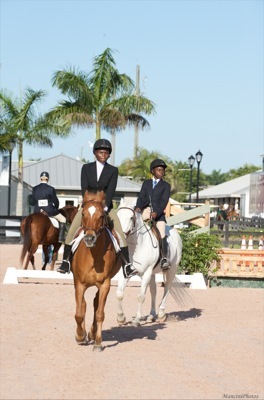 Riders from Chateaublond Equestrian Center competing at PBIEC. A fundraising luncheon will be hosted to benefit the riders of Chateublond and the Friends of the Orphans organization that supports it. The luncheon will be held Sunday, February 24, at noon in The Wellington Club at the PBIEC. Thirty volunteers from VTRC as well as a special team of horses from the center will help make Saturday’s competition possible. VTRC has been training riders for the Special Olympics since 1982 and always represents the largest contingent of riders in the county competition. Volunteers are needed to assist with leading horses and aiding riders from Vinceremos and Haiti during the Special Olympic competition, from 8:30 am to 1 pm. To register, please call Kim at 561-792-9900 or email her at Kim@vinceremos.org. Volunteers are an integral part of the program. VTRC would like to express their gratitude to all of the volunteers, horses, and to the Wellington Community as whole, whose generosity makes their program for Special Olympics competitors possible. ← Kanaval Comes to Kay St. Germaine!